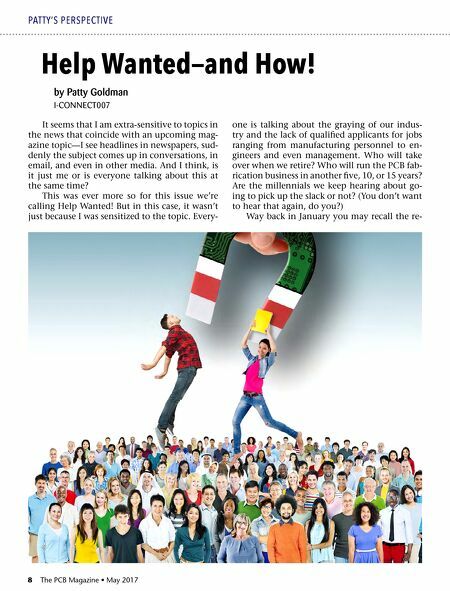 May 2017 • The PCB Magazine 9 sults of our 2017 industry hiring survey, where more than half of respondents planned to bring on new employees this year, and half of those were talking the first six months. It appeared that most of the hires would be for technical, operations and sales personnel, which we felt pointed to an expansion in the industry. But the greatest challenge by far that respondents pointed to was a shortage of skilled or qualified applicants. One thing we can learn from reading or watching news is that it's not just our segment of manufacturing that has this problem. It is pretty much the entire manufacturing industry that is struggling to find people to work in their factories and engineers to keep them running. What to do about this phenomenon was the topic at the IPC APEX EXPO show in February. It seemed no matter what topic a conversation started with, it ended up with the concern on everyone's mind: how difficult it is to find good people. We put an ad in (wherever) and got no responses; process and quality engineers are no- where to be found; we hire someone, they quit in short order. 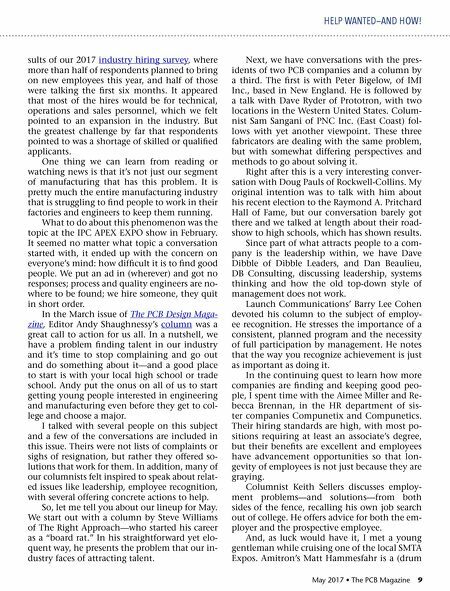 In the March issue of The PCB Design Maga- zine, Editor Andy Shaughnessy's column was a great call to action for us all. In a nutshell, we have a problem finding talent in our industry and it's time to stop complaining and go out and do something about it—and a good place to start is with your local high school or trade school. Andy put the onus on all of us to start getting young people interested in engineering and manufacturing even before they get to col- lege and choose a major. I talked with several people on this subject and a few of the conversations are included in this issue. Theirs were not lists of complaints or sighs of resignation, but rather they offered so- lutions that work for them. In addition, many of our columnists felt inspired to speak about relat- ed issues like leadership, employee recognition, with several offering concrete actions to help. So, let me tell you about our lineup for May. We start out with a column by Steve Williams of The Right Approach—who started his career as a "board rat." In his straightforward yet elo- quent way, he presents the problem that our in- dustry faces of attracting talent. Next, we have conversations with the pres- idents of two PCB companies and a column by a third. The first is with Peter Bigelow, of IMI Inc., based in New England. He is followed by a talk with Dave Ryder of Prototron, with two locations in the Western United States. Colum- nist Sam Sangani of PNC Inc. (East Coast) fol- lows with yet another viewpoint. These three fabricators are dealing with the same problem, but with somewhat differing perspectives and methods to go about solving it. Right after this is a very interesting conver- sation with Doug Pauls of Rockwell-Collins. My original intention was to talk with him about his recent election to the Raymond A. Pritchard Hall of Fame, but our conversation barely got there and we talked at length about their road- show to high schools, which has shown results. Since part of what attracts people to a com- pany is the leadership within, we have Dave Dibble of Dibble Leaders, and Dan Beaulieu, DB Consulting, discussing leadership, systems thinking and how the old top-down style of management does not work. Launch Communications' Barry Lee Cohen devoted his column to the subject of employ- ee recognition. He stresses the importance of a consistent, planned program and the necessity of full participation by management. He notes that the way you recognize achievement is just as important as doing it. In the continuing quest to learn how more companies are finding and keeping good peo- ple, I spent time with the Aimee Miller and Re- becca Brennan, in the HR department of sis- ter companies Compunetix and Compunetics. Their hiring standards are high, with most po- sitions requiring at least an associate's degree, but their benefits are excellent and employees have advancement opportunities so that lon- gevity of employees is not just because they are graying. Columnist Keith Sellers discusses employ- ment problems—and solutions—from both sides of the fence, recalling his own job search out of college. He offers advice for both the em- ployer and the prospective employee. And, as luck would have it, I met a young gentleman while cruising one of the local SMTA Expos. Amitron's Matt Hammesfahr is a (drum HELP WANTED—AND HOW! Feature Column — Finding the Next Generation of "Board Rats"